↑ "Ceremonies and Protocol – The Presidential Standard". The Istana, Office of the President of the Republic of Singapore. 17 April 2008. สืบค้นเมื่อ 2008-12-03. ↑ Herman Felani (1 November 2003). "War Ensign (Singapore)". Flags of the World. สืบค้นเมื่อ 2008-12-07. ↑ "SAF Core Values". Republic of Singapore Navy. 2005-07-08. สืบค้นเมื่อ 2009-11-19. ↑ 6.0 6.1 6.2 Choy Choi Kee. "1967 – Beginnings of the Singapore Navy". This Month in History (7 May 1997, last updated 16 December 2008). Joint Manpower Department, Ministry of Defence. สืบค้นเมื่อ 2008-12-24. 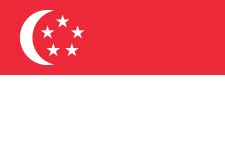 ↑ "State Ensign (Singapore)". Flags of the World. 2006-08-05. สืบค้นเมื่อ 2009-11-30. ↑ "1960, Misc. 6 - State Marine ensign". Government of Singapore. 1960. สืบค้นเมื่อ 2009-11-30. "No conflict, clear-cut symbol of unity". The Sunday Times. 1981-08-09. p. 13. Aslaksen, Helmer (2007-03-11). "The mathematics and astronomy of the Singapore flag". Department of Mathematics, National University of Singapore. สืบค้นเมื่อ 2007-11-03. หน้านี้แก้ไขล่าสุดเมื่อวันที่ 13 กุมภาพันธ์ 2562 เวลา 12:29 น.